I bought some the other day but when I left the store, I realized they were past their best before date. Quite a few of their items are like this so just be aware. 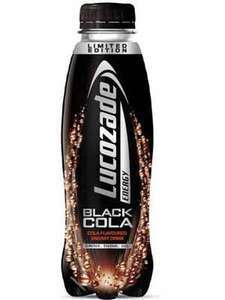 I think Coca Cola would have something to say if they tried to call it Lucozade Coke. They can't give this flavour away lately.. I think Coca Cola would have something to say if they tried to call it … I think Coca Cola would have something to say if they tried to call it Lucozade Coke. Do you like Lucozade? Do you like Cola? Then you'll love, LUCOZADE COLA! I had one bottle of it and I thought it was really nice actually. it is quite nice, suffers from the same thing as all Lucozade though in that it goes flat very quickly. grabbed a bottle after footie tonight, tastes quite nice but was a bit gassy for a sports drink (if you are actually doing sports after drinking it) and also went flat very fast after being stuffed in a pocket on my jog home. i'd stick with orangy ones. Surprisingly good! I don't really drink pepsi or coke just because they are to sweet to my taste but this one is just right. I love the taste of this gives a hit too ! I think you'll find that it is copyrighted. It's the future.... I've tasted it ! !